If you're like most people, you probably hate painting prep. Putting down floor cloths and removing light switch and outlet covers can feel like wasted time, but it's important for clean results and to prevent messy accidents. On the other hand, applying masking tape alongside window and door trim, above baseboards, and below crown molding is considered optional prep work, and you're usually better off skipping it altogether. A painting technique often associated with professional painters and less so with DIYers promises to eliminate masking. It uses no gimmicky paint edgers, either. Involving only a steady hand and a brush, this technique is called cutting in. The practice involves manually drawing straight lines of paint alongside elements that do not get painted, eliminating the need for masking tape or painter's masking film. Imagine that you want white trim around your windows, surrounded by darker colored walls. First, you paint the trim. Then, when you paint the walls, you need to bring the paint line right up to the edge of the trim. You could mask off the trim with tape, but if you have a steady hand, you can simply "draw" the line of colored paint freestyle. The only specialty supplies you need for cutting in are a 2-inch brush and a "cut bucket." Pros recommend an angled brush, often called a sash brush. A cut bucket is simply a paint bucket that has no lip. The lip allows for paint to accumulate, giving you more paint than you want on the brush. Even a plastic bucket will work—just any sturdy bucket with straight sides. Fill a cut bucket with no more about 1/2 inch of paint. Keep the sides of the bucket clear for wiping off excess paint from your brush. Dab the tip of the brush into the paint, and drag the bristles against the edge of the bucket to remove excess paint. The brush should be relatively dry. It does not take much paint to cover trim. Grip the brush loosely near the bristles, similarly to gripping a pencil. Place the bristles on the surface, forming a wedge shape. Use the sharp end of the wedge to start the paint line. Draw the bristles along the line you want to paint. As you begin moving the bristles, try to let them form a fan shape. The outermost bristles are actually drawing the line, not the entire bristle surface. You will first want to draw very flat crescents. These crescents will start slightly away from the line, move over and track along the line for a few inches, then gradually pull away from the "danger zone" (glass, trim, or whatever that is not getting painted) and toward yourself. You can cobble together a long straight line through several of these flat crescents. As you get more experienced, you will find the crescents getting fewer and flatter until you can draw quite a long line with a single linear brush motion. Use a clean, white rag slightly dampened with water to wipe off paint that gets onto unintended surfaces or to clean up a messy line. 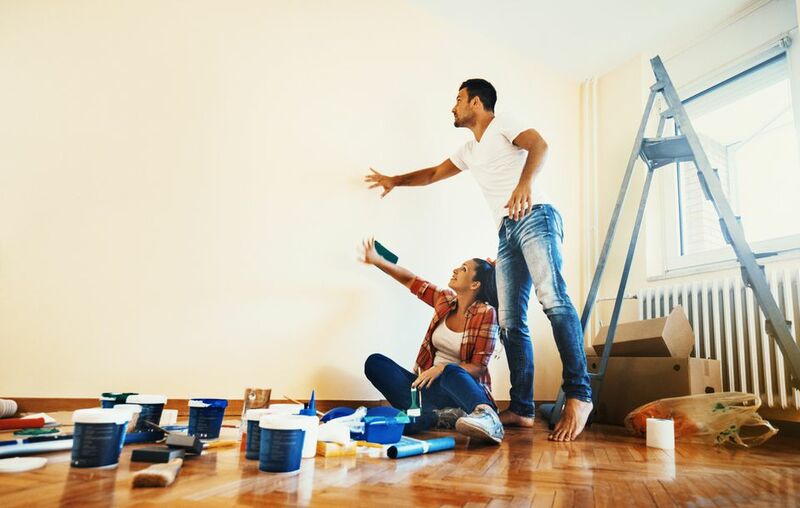 If you wipe the paint as soon as it's applied, it will come off with no trouble. Waiting just a few minutes can make it harder to remove. For this reason, it's a good idea to keep a damp rag handy at all times (because some goofs are inevitable, at least while you're learning).